Greenland Glaciers — not so fast! There have been several recent papers on ice sheets and sea level that have gotten a bit of press of the journalistic whiplash variety (“The ice is melting faster than we thought!” “No, its not!”). As usual the papers themselves are much better than the press about them, and the results less confusing. They add rich detail to our understanding of the ice sheets; they do not change estimates of the magnitude of future sea level rise. One of these recent papers, by Hellmer et al., discusses possible mechanisms by which loss of ice from the great ice sheets may occur in the future. Hellmer et al.’s results suggest that retreat of the Ronne-Filchner ice shelf in the Weddell Sea (Antarctica) — an area that until recently has not received all that much attention from glaciologists — might correspond to an additional rise in global sea level of about 40 cm. That’s a lot, and it’s in addition to, the “worst case scenarios” often referred to — notably, that of Pfeffer et al., (2008), who did not consider the Ronne-Filchner. However, it’s also entirely model based (as such projections must be) and doesn’t really provide any information on likelihood — just on mechanisms. Among the most important recent papers, in our view, is the one by Moon et al. in Science earlier this May (2012). The paper, with co-authors Ian Joughin (who won the Agassiz Medal at EGU this year), Ben Smith, and Ian Howat, provides a wonderful new set of data on Greenland’s glaciers. This is the first paper to provide data on *all* the outlet glaciers that drain the Greenland ice sheet into the sea. The bottom line is that Greenland’s glaciers are still speeding up. But the results put speculation of monotonic or exponential increases in Greenland’s ice discharge to rest, an idea that some had raised after a doubling over a few years was reported in 2004 for Jakobshavn Isbræ (Greenland’s largest outlet glacier). Let it not be said that journals such as Science and Nature are only willing to publish papers that find that thing are “worse than we thought”! But neither does this new work contradict any of the previous estimates of future sea level rise, such as that of Vermeer and Rahmstorf. The reality is that the record is very short (just 10 years) and shows a complex time-dependent glacier response, from which one cannot deduce how the ice sheet will react in the long run to a major climatic warming, say over the next 50 or 100 years. These new data provide an important baseline and they will remain important for many years to come. We asked Moon and Joughin to write a summary of their paper for us, which is reproduced below. 1) Glaciers in the northwest and southeast regions of the Greenland ice sheet, where ~80% of discharge occurs, sped up by ~30% from 2000 to 2010 (34% for the southeast, 28% for the northwest). 2) On a local scale, there is notable variability in glacier speeds, with even neighboring glaciers exhibiting different annual velocity patterns. There are a few points on our research that may be easy to misinterpret, so we’re taking this opportunity to provide some additional details and explanation. The Greenland ice sheet changes mass through two primary methods: 1) loss or gain of ice through melt or precipitation (surface mass balance) and 2) loss of ice through calving of icebergs (discharge) (Figure 1) [van den Broeke et al., 2009]. It is not uncommon for people to confuse discharge and melting. Our measurements from Greenland, which are often referred to in the context of “melt”, are actually observations of velocity, and thus relate to discharge, not in situ melting. Figure 1. 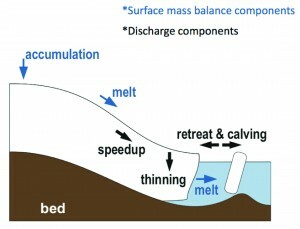 Components of surface mass balance and discharge. Most components can change in both negative (e.g., thinning) and positive directions (e.g., thickening). When glaciologists refer to “increased melt” they are usually referring to melt that occurs on the ice sheet’s top surface (i.e., surface mass balance). Surface melt largely is confined to the lower-elevation edge of the ice sheet, where air temperature and solar radiation can melt up to several meters of ice each year during summer. Melt extent depends on air temperatures which tend to be greatest at more southerly latitudes. Meltwater pools in lakes and crevasses, often finding a path to drain through and under the ice sheet to the ocean. Glaciologists and oceanographers have found evidence for notable melt where the ice contacts ocean water [Straneo et al., 2010]. So, when you hear about ice sheet “melt”, think surface lakes and streams and melting at the ends of the glaciers where they meet the ocean. So, why focus on velocity instead of melt? Velocity is more closely related to the discharge of ice to the ocean in the process of which icebergs break off, which float away to melt somewhere else potentially far removed from the ice sheet. You can picture outlet glaciers as large conveyor belts of ice, moving ice from the interior of the ice sheet out to the ocean. Our velocity measurements help indicate how quickly these conveyor belts are moving ice toward the ocean. Given climate change projections of continued warming for the Greenland ice sheet [IPCC, 2007], it’s important to understand at what speeds Greenland glaciers flow and how they change. On the whole, the measurements thus far indicate overall speedup. It turns out that on any individual glacier, however, the flow may undergo large changes on an annual basis, including both speeding up and slowing down. With these detailed measurements of glacier velocity, we can continue to work toward a better understanding of what primary factors control glacier velocity. Answers to this latter question will ultimately help us predict the ice sheet’s future behavior in a changing climate. Translating velocity change into changes in sea level rise is not a straightforward task. Sea level change reflects the total mass of ice lost (or gained) from the ice sheet. Determining this quantity requires measurements of velocity, thickness, width, advance/retreat (i.e., terminus position), and density – or, in some cases, an entirely different approach, such as measuring gravity changes. Our study does not include many of the measurements that are a part of determining total mass balance, and thus total sea level rise. In another paper that we highlight in our study, Pfeffer et al. used a specifically prescribed velocity scaling to examine potential worst-case values for sea level rise. The Pfeffer et al. paper did not produce “projections” of sea level rise so much as a look at the limits that ice sheet dynamics might place on sea level rise. It is reasonable to comment on how our observations compare to the prescribed velocity values that Pfeffer et al. used. They lay out two scenarios for Greenland dynamics. The first scenario was a thought experiment to consider sea level rise by 2100 if all glaciers double their speed between 2000 and 2010, which is plausible given the observed doubling of speed by some glacier. The second experiment laid out a worst-case scenario in which all glacier speeds increased by an order of magnitude from 2000 to 2010, based on the assumption that greater than tenfold increases were implausible. The first scenario results in 9.3 cm sea level rise from Greenland dynamics (this does not include surface mass balance) by 2100 and the second scenario produces 46.7 cm sea level rise by 2100. The observational data now in hand for 2000-2010 show speedup during this period was ~30% for fast-flowing glaciers. While velocities did not double during the decade, a continued speedup might push average velocities over the doubling mark well before 2100, suggesting that the lower number for sea level rise from Greenland dynamics is well within reason. Our results also show wide variability and individual glaciers with marked speedup and slowdown. In our survey of more than 200 glaciers, some glaciers do double in speed but they do not approach a tenfold increase. Considering these results, our data suggest that sea level rise by 2100 from Greenland dynamics is likely to remain below the worst-case laid out by Pfeffer et al. By adding our observational data to the theoretical results laid out by Pfeffer et al., we are ignoring uncertainties of the other assumptions of their experiment, but refining their velocity estimates. The result is not a new estimate of sea level rise but, rather, an improved detail for increasing accuracy. Indeed, a primary value of our study is not in providing an estimate of sea level rise, but in offering the sort of spatial and temporal details that will be needed to improve others’ modeling and statistical extrapolation studies. With just ten years of observations, our work is the tip of the iceberg for developing an understanding of long-term ice sheet behavior. Fortunately, our study provides a wide range of spatial and temporal coverage that is important for continued efforts aimed at understanding the processes controlling fast glacier flow. The record is still relatively short, however, so continued observation to extend the record is of critical importance. In the same Science issue as our study, two perspective pieces comment on the challenges of ice sheet modeling [Alley and Joughin, 2012] and improving predictions of regional sea level rise [Willis and Church, 2012]. Clearly, all three of the papers are connected, as much as in pointing out where we need to learn more as in indicating where we have already made important strides. Alley, R. B., and I. Joughin (2012), Modeling Ice-Sheet Flow, Science, 336(6081), 551-552. IPCC (2007), Climate Change 2007: The Physical Science Basis. Contribution of Working Group I to the Fourth Assessment Report of the Intergovernmental Panel on Climate Change, S. Solomon et al., Eds., Cambridge University Press, ppp 996. Moon, T., I. Joughin, B. Smith, and I. Howat (2012), 21st-Century Evolution of Greenland Outlet Glacier Velocities, Science, 336(6081), 576-578. Pfeffer, W. T., J. T. Harper, and S. O’Neel (2008), Kinematic constraints on glacier contributions to 21st-century sea-level rise, Science, 321(000258914300046), 1340-1343. Straneo, F., G. S. Hamilton, D. A. Sutherland, L. A. Stearns, F. Davidson, M. O. Hammill, G. B. Stenson, and A. Rosing-Asvid (2010), Rapid circulation of warm subtropical waters in a major glacial fjord in East Greenland, Nature Geoscience, 3(3), 1-5.
van den Broeke, M., J. Bamber, J. Ettema, E. Rignot, E. Schrama, W. Van De Berg, E. Van Meijgaard, I. Velicogna, and B. Wouters (2009), Partitioning Recent Greenland Mass Loss, Science, 326(5955), 984-986. Willis, J. K., and J. A. Church (2012), Regional Sea-Level Projection, Science, 336(6081), 550-551. Let me clarify my previous statement concerning MA’s post. I agree with his statement that arguments showing the loss of Greenland’s ice mass as increasing exponentially are entirely unconvincing. Statements from links presented here seem to agree with that. For example: Forsberg, “Current changes of Greenland accelerating, but slowly.” Joodaki, “Although the mass loss of the ice sheet is not constant, we decided to represent the GRACE observations by a linear trend. We cannot observe a significant acceleration term over whole data series.” Bergman, “The decrease of Greenland Ice Sheet ice mass is clearly not constant in time, but contains interannual variability suggesting that the ice mass melting is a transitional complex phenomenon.” Box (estimates from MODIS), “The cumulative pattern of area change from the 39 glaciers surveyed indicates a linear and geographically widespread retreat pattern.” Many papers choose to describe the ice mass loss as linear, not because it was the best fit to the data, but as a general descriptor. None of the data presented show a statistically significant trend. Bergman also stated that, “the mass balance of the Greenland Ice Sheet is dominated by snowfall in regions of high elevation and by glacier discharge in regions of lower elevation.” The higher rates of ice mass loss were dominated by large losses in the SE glaciers corresponding to higher North Atlantic SST. This agrees with Tim’s assertion of basal melting due to higher SST (hope he’s still here). The recent large drop in N. Atlantic SST may shed some light on this. A non-rhetorical question for TimD from a non-scientist: How do you determine when or if an accelerating [fit to a] curve has ceased to accelerate and thereby lose its predictive value? Otherwise stated, how much data is required before one suspects a point of inflection is coming up? (A poor example, no doubt, but logistic curves are exponential up until they aren’t.) I am not suggesting that is happening here but curious to know how scientists determine future acceleration. Thank you for finally agreeing that the rate of mass loss is increasing. All of those quotes clearly state that rate is increasing. It is not held constant and it certainly can be separated from noise (your previous two analyses of the literature being incorrect). It is important to note that what is increasing is the rate of mass loss, not just total mass lost. As a very simple example, if I have 100 apples, on day 1 I remove 1 apple and am left 99. Then to have a linearly increasing rate of loss the next day I remove 2 apples, and have 97, then day 3 apples, then 4. So after 4 days I have removed 10% of the apples am left with 90, instead of the 96 I would have if “apples lost” (total mass loss) itself was linear. So you can see, even a linear increase the rate of Greenland’s ice mass loss is more of a concern than if mass loss was a constant linear rate. > but as a general descriptor. > None of the data presented show a statistically significant trend. What? ‘many papers’ — which specific papers fit the above description? It’s rather damning, if true, isn’t it? Thank goodness we can exclude the possibility of cascading positive feedbacks along with any paleo evidence of rapid ice sheet collapse. Mertonian Norm; I appreciate the excellent question and I would hope that a principal/scientist from this site would also comment on it, since it is an important concept. I am a geophysicist, not a climate scientist, but I think I pretty well understand the science in a closely related discipline that I have closely followed for over 30 years. I believe that in the current environment of rapidly rising temperatures in a climate system clearly dominated by positive feedback mechanisms, it is of utmost importance to search carefully for indications of non-linear effects, since that is a hallmark of positive feedback. The rapid loss of ice mass over the last decade, best measured by the GRACE global gravity system, clearly shows a consistent acceleration. If it continues along that trajectory, as it has for at least a decade, then we become increasingly certain that the underlying mechanism is a positive feedback effect. But the important thing is to understand that it is, in effect, a siren, screaming that we need to understand that underlying mechanism as soon as possible. This point is even more significant when one considers that many eminent glaciologists have said over and over, that the “fundamental response time of continental ice sheets is thousands of years”. This effect (ice mass loss) is clearly responding to warming in a matter of a few years, so it is very obvious that the science is seriously lacking in the current environment, which in turn points to areas where significant resources and effort needs to be directed. In terms of predictive value, it is a certainty that the exponential character we observe in natural systems will eventually, and usually quickly, cease to continue accellerating, since this behavior rapidly leads to absurdly high values of whatever parameter is being measured. But that also means that due to rapid growth, that parameter will very quickly become a significant or dominant element in the overall system. In the case of polar ice sheet mass loss, Hansen has already studied the effects of the rapid release of cold, fresh meltwater into the oceans and found that high rates of polar warming are likely to suddenly cease, with severe, but hard to predict effects on the stability of the global climate system. I very strongly recommend the Sato-Hansen paper, since it discusses these issues, and puts the current extremely rapid climate system forcing due to increases in GHGs, into the context of what we know about paleoclimatology. That paper direclty illustrates the degree to which the advent of large polar ice sheets has amplified the very subtle forcings of earths orbital cycles which gave rise to the series of ice ages in the Pleistocene. The GHG forcings are large and they are likely more rapid than anything the earth has experienced since the Chicxulub asteroid killed the dinosaurs 65 million years ago. There absolutely has to be a strong, global effort to comprehensively understand the mechanism behind the accellerating mass loss observed with certainty in both Greenland and Antarctica, as well as the numerous other interacting positive feedback mechanisms that are popping up everywhere. This is a serious global emergency, and anything that downplays the seriousness of the situation must be aggressively countered. That is why I am more than a bit strident about this issue. Ah, Hank, thank you for being a more careful reader than I was. I see Dan H. is still confusing the issue. He is seeing the handful of papers that would describe the increase in the rate of loss as linear, and then confounding that with actual ice mass loss. Shame on me for not reading it more carefully. Obviously if the rate of loss increasing linearly, then the total ice mass lost is faster than that. I find this much easy to describe in math than words, so I hope my apple analogy was decent enough. A linear increase in the rate (1,2,3,4…) would lead to a mass loss increasing faster (1,3,6,10…). So even if the low estimates of a linear increase in the rate are correct, I don’t find that comforting. Unsettled Scientist @154, Thank-you, Thank-you, Thank-you,… for the superb layman’s explanation for most of the confusion on this topic thread. You must be a very good teacher in real life. How have you determined that the linear trend can be seperated from noise, especially since the cited papers cannot? As stated in post #130, the rate of increase in mass ice loss decreased from 60 Gt/yr^2 to 6 Gt/yr^2. Considering that the uncertainty in the most recent ice mass loss is ~30 Gt, this can certaintly not be seperated from noise. > this can certaintly not be seperated from noise. That’s weather: a few years’ worth. No trend detectable in that few data points. Your question highlights a bit of your confusion. I didn’t say that the linear trend can be separated from noise. That the trend is positive (increasing) has been separated from the noise, the rate of ice mass loss is unquestionably increasing. Whether that is a linear increase or something much more complex (my suspicion) is the question. Whether it be 60 or 6, both are positive numbers and show an increasing rate of mass loss, not being held constant or hidden in noise. Simplified math for an example. I start with 500 units of ice and the rate of loss is 60. Then next year I start with 440 and the rate of loss increases 60 (=120 units/yr). Then next year I have 320 units of ice left and the rate increases just 6 units (=126 units/yr). So then next year I start with 194 units of ice. The trend is a faster rate of loss. It might not be a linear increase in the rate (or exponential or other fit), but we are still losing ice more quickly than before. Also, I’m not sure if you were able to see my 5:59pm reply when you posted. What you wrote, that Hank was diligent enough to read carefully, is clearly incorrect. I think the two roots of your confusion are conflating the of ice mass loss with net ice mass loss. This is evidenced in what Hank quoted of yours 4:58pm (#155). The second root of your confusion is conflating the shape of the trend, with the sign of trend. I explained that above: the trend for the rate of ice mass loss is increasing, but we don’t know its shape yet be it linear, exponential or something different. Obviously, if the rate of ice mass loss is increasing (no matter its shape) then there is clearly significant trend in ice mass loss itself. I think I messed up an html bold tag and removed the word. Very interesting article in Science Daily about Knud Rasmussen the danish explorer who took many photos of SE greenland in the early 1930s. What it shows is that the rate of melt of glaciers then was comparable to that of today and in some cases even faster. These glaciers photographed were land terminating so did not cause any consequent sea level rise. Then in the 1940s to the 1970 a period of relative cooling caused by high levels of sulphur dioxide in the atmosphere stabilised the glacial melt and even partially restored any loss of mass in from the 1930’s back. What is fascinating to me is that the clean air act took effect in 1963 I believe and a return to glacier retreat in greenland began in earnest at about 1972 up to today. That to me shows that for suphur dioxide at least the inertia when it comes to the atmosphere is about 10 years or less since factories wouldn’t suddenly have cleaned up ther act overnight. So I could be naive in thinking but that indicates to me that atmospheric seeding with certain chemicals would cause quite dramatic and rapid results and the sooner this is done the better for only the sake of buying us invaluable time as we do not want to warm the oceans one jot more than what they are at present..that is the unstoppable juggernaut in the entire system. What do you guys think? No confusion on my part, although I mentioned both ice mass loss and the rate of ice mass loss. I understand that a linear (or otherwise) increasing trend in the rate of ice mass loss results in acceleration in total ice mass loss. Visually, the data shows an increase. Statistically, the increase in not significantly different from zero. In other words, we can say with any reasonable certainty that the trend is increasing. Part of this is due to the short time period of the GRACE data, part to the large uncertainty in the estimations themselves. The Joodaki paper (cited previously) agrees quite well with the Forsberg paper except for 2003. Its 8-year trend show an increase of slightly more than 3 Gt/yr^2. Again positive, but not significantly different from zero. Reading the Bergman paper, the citation from Lawrence above, and Allen’s ice core measurements, the Greenland ice sheet has shown anything but a linear trend. I agree that the rate of ice mass loss in the previous decade was higher than in the 1980s and 1990s. Glaciers are dynamic. However, claims of significant continued acceleration are unfounded. Putting forth theories, like Hansen and Sayo are fine, and may help to understand the future changes. But until they are support with data, we should treat them as such. Tim, I am curious as to your thoughts on how the recent SST will affect basal melting. Clearly you are still confused. Immediately after I say don’t worry about the shape of the trend but the sign of the trend you are back to talking about whether or not we can see a linear shape. If you’re not confused, then you are saying it was either a careless mistake or intentional misrepresentation when you wrote, “Many papers choose to describe the ice mass loss as linear, not because it was the best fit to the data, but as a general descriptor. None of the data presented show a statistically significant trend.” Because that is blatantly wrong. If it was a mistake I would expect you would have owned up to it, so what am I left to assume if you don’t say you were wrong? Simply mentioning both the rate and net ice mass loss isn’t sufficient to lack confusion. You have to use them in the correct context in order to be accurate. If you aren’t confused, you are certainly adding to the confusion in this thread through either laziness or deceit. Sadly, we cannot access your Joodaki paper. You are notorious for cherry picking quotes out of papers and misrepresenting them. For example in this very thread when you wrote, “A better analysis would be that ice mass loss has held constant at ~230GT / yr as Rene Forsberg concluded.” When we went and read the paper you linked, Forsberg concluded it was increasing, not held constant. So forgive us if we don’t trust your reading of the literature. I’m sorry, but you can’t take the results of scientists who say it’s increasing but slowly and claim that means it is insignificant. That’s dishonest. Here is another example of either your confusion, or an attempt to conflate two separate things in order to confuse laymen. In post #122 you provide a link and cherry pick a quote out of it. So again, don’t fault anyone who doesn’t trust your reading of the literature. You consistently come to different conclusions than the references you provide, and you consistently mix up your concepts comparing apples to motorcycles. I hate to keep feeding the troll, so I think I’ll let this be my last word on this subject. Sadly Dan H. is quite prolific throwing up links to references and then misrepresenting them on this site. There is nothing dishonest, in my posts, nor am I confused. Perhaps you are not understanding me correctly. There was nothing careless, nor misrepresented in my statement. Since, you claim that my statement about the papers not showing a statistically significant trend is wrong; you should be able to show me an instance where it does. My statement concerning the Forsberg paper is accurate as written. The presentation clearly states recent ice mass losses as ~230Gt +/- 30 Gt. My contention is that “constant” is a better descriptor of the data than “accelerating, but slowly,” since the increase is not statistically significant. Maybe, “held constant,” is too strong a declaration, and “no clear trend” would be a better representation than either Forsberg’s or my statement, since the trend has a poor coefficient of determination, and the uncertainty in the data exceeds the trend. No confusion on my part …. > …. data shows an increase. > significantly different from zero…. > that the trend is increasing…. > Again positive, but not significantly different from zero. Would someone personally adquainted with Dan H.
look in on him and see if you can help him? This is word salad with number sprinkles. but it’s not getting across and the topic’s lost in the fog. Perhaps the scientists could sum things up and get it sorted out? Dan H., Expand exp(lt) in a Taylor series in t. Now assume l>>t. Does this make it clearer why researchers might look for a linear trend for data over short periods, regardless of the actual dependence? Visually, the data shows an increase. Statistically, the increase in not significantly different from zero. The p-value is 0.01781. That’s statistically significant. How many more times will you do this, Dan? Once again you have been proved wrong. Will you once again ignore that hoping it will go away? Will you once again refuse to own up to your misrepresentation? Will you ever admit that you’re wrong? Will you ever even consider the possibility that your entire belief system is based on wishes rather than scientific evidence? Or, will you simply move on to your next patently, demonstrably, provably false claim? How many more times must we endure his kind of garbage? That two-word sentence is really all that needs to be said in response to each and every one of Dan H’s comments. Indeed. So clever of me to enable that. With this comment thread swinging from talk of annual ice loss last year to geological timespans, nothing I write or read would immediately surprise me. By ‘”feedbacks” I meant that the likes of say a sustained ‘7-year doubling’ of lost ice would quickly overpower the temperature rise that was driving it, this holding true almost as quickly even if such doublings led to icebergs bobbing round the tropics in search of warmth. So I speak of “feedbacks” of a temporary delaying nature only. Putting numbers onto that assertion, the data from Box et al (Data graphed here) shows the present level of Greenland’s annual ice loss at some 350 Gt pa (Box et al state 430 Gt pa to April 2011). It is thus contributing 1mm pa to sea level rise & requiring 0.12 zJ of latent energy. A linear 33 Gt pa increase would yield by mid-century 1,736 Gt pa of ice loss, causing 4.8 mm pa of SLR & requiring 0.6 zJ to melt. A ‘7-year doubling’ would yield values 13x bigger and thus the latent energy absorbed in just Greenland’s ice loss will be about equal to the total present-day annual OHC rise. has an excellent overview with many links to sources. The Gravity Recovery and Climate Experiment (GRACE) satellite data is used to estimate the rate of ice mass variability over Greenland. To do this, monthly GRACE level 2 Release-04 (RL04) data from three different processing centers, Center for Space Research (CSR), German Research Center for Geosciences (GFZ) and Jet Propulsion Laboratories (JPL) were used during the period April 2002 to February 2010. It should be noted that some months are missing for all three data sets. Results of computations provide a mass decrease of −163 ± 20 Gigaton per year (Gt/yr) based on CSR-RL04 data, −161 ± 21 Gt/yr based on GFZ-RL04 data and −84 ± 26 Gt/yr based on JPL RL04.1. The results are derived by the application of a non-isotropic filter whose degree of smoothing corresponds to a Gaussian filter with a radius of 340 km. Striping effects in the GRACE data, C20 effect, and leakage effects are taken into the consideration in the computations. There is some significant spread of the results among different processing centers of GRACE solutions; however, estimates achieved in this study are in agreement with the results obtained from alternative GRACE solutions. Meta-comment: The discussion w/the person referencing the Joomaki paper highlights the fundamentally anti-Enlightenment nature of closed-access journals. The content of the article in question is secret, shared only between those who are privileged to read it. Indeed there are legal sanctions against violating this secrecy so as to bring all discussants onto an equal footing. Eschewing secrets made the scientific establishment possible but the scientific establishment is now held hostage by tradesmen whose wealth depends on anachronistic, artificially maintained scarcity. How long can this silly tension be preserved? Beyond legally required maintenance of ignorance, the other asymmetry here concerns the person who originally cited Joomaki. This person feels comfortable with remaining hidden while routinely leaning on the efforts of others willing to attach real names and real credibility to their work. For my part I’m curious to know whose money this person is spending on journal access; the Joodaki paper is $34.95 for single access while a subscription to the publishing journal itself is ~EUR 1,800/year. Is this an enthusiastic hobbyist, a graduate student slacking off, an employee? Inquiring minds want to know. It sounds like Dan H’s primary point is that the the length of record is too short to determine whether the mass loss is going down linearly or exponentially or some other way. Essentially, he’s arguing that the Rule Of Thumb for global temperatures should apply here, and 17 to 30 years are needed to determine a trend. Perhaps someone could address this? I understand why researchers present data as a linear trend over the short term. That does not mean that the correlation is indeed linear, but that there is not enough data to establish a better correlation. The trend could be linear, exponential, sinusoidal, etc. It is an attempt to show was has happened during the measurement period, without making a broad claim as to the actual relationship. Performing linear regression analyses on data with large uncertainties is fraught with error, and can yield values which appear to be much more significant than they actually are. It is a fool’s errand. That said, I am not claiming that the rate of ice mass loss is not increasing linearly. The Joodaki data yields a better linear fit than the Forsberg data, which is better represented by a decreasing polymeric or exponential equation. As many of the article state, there are several different ice sheet dynamics occurring at different sites and at differnent terminating glaciers. To assign a single characteristic to the entire ice sheet is both difficult and inaccurate. But as Twila Moon (and others) have stated, as more data as been analyzed, the fears of exponential ice mass loss appear to be alleviated (for now). Congrats to you folks for being patient and methodically and rationally destroying each and every bit of denialist crap thrown out there. I almost feel sorry for the guy, but he actually being civil and I think we owe him that simple courtesy. It is getting old, however. I think a surrender is in order. If that is Dan H’s “primary point” then he’s perfectly capable of saying that — instead of repeatedly and blatantly misrepresenting the sources he cites. that’s wrong, there’s no such rule. Statistics looks at any given data set, looks at how variable it is, and tells you how many observations you’ll need to have a good chance of saying correctly that a trend exists in that data. No, Dan H. isn’t applying the “rule of thumb” for temperature data to insist on 17 years. He just feels privileged to say whatever he wants to say. Unfortunately for him, he’s in the wrong place for that. Readers here have a tendency to check references and do the math. The researchers analyzed satellite images of the Greenland glaciers taken between 2000 and 2010. These annual images were put through a computer program to detect how quickly the ice is moving. In general, the glacial flow has sped up by 30 percent over the 10 years, Moon said. Sounds like a curve, huh? Color me stupid, but what I’ve been taught is that a curve means acceleration, which by extension seems to implicate an exponent in somewhere in the plot. Twila Moon has the advantage of not being an anonymous source of comments on a blog so I’m going to hang the credibility flag on her peg. The rest of the article states, “The record showed a complex pattern of behavior. Nearly all of Greenland’s largest glaciers that end on land move at top speeds of 30 to 325 feet a year, and their changes in speed are small because they are already moving slowly. Glaciers that terminate in fjord ice shelves move at 1,000 feet to a mile a year, but didn’t gain speed appreciably during the decade. In the east, southeast and northwest areas of Greenland, glaciers that end in the ocean can travel seven miles or more in a year. Their changes in speed varied (some even slowed), but on average the speeds increased by 28 percent in the northwest and 32 percent in the southeast during the decade. Only the glaciers in the SE and NW averaged the 30% increase. The rest showed little movement. The curve seems to have gotten quite a bit smaller, according to Twila. Did somebody say something? I heard Twila Moon but what was the squeaking sound just after, the thing that sounded a little like a synthetic, ersatz Twila Moon but was plainly wrong? The way you quote Ian Howat is dishonest. You use it to contradict the idea that things could be worse, but you don’t even include the entire sentence, you end it with the comma. This is what we mean when we say that you misrepresent the scientists and references you use. When we put what your quotes into context, the meaning is opposite of how you used it. Howat’s caveat is that there are conceivable events that could make the ice mass loss far worse than this paper shows, not that we are completely clueless about the ice mass loss or that it isn’t increasing. Ugh, I didn’t want to feed into your nonsense again but you continue to cherry pick words and numbers and twist them to make it seem like scientists are saying something they are not. Since I’m here, I’ll point out once again your cognitive dissonance. No, your statement concerning the Forsberg paper is not accurate as written! You changed his conclusion and claimed he said what you want to believe, not what was actually in his presentation. Seriously, this mockery of the truth needs to stop. Though it won’t because confusing readers is your intention. I do remain confused, however, why it is this site allows the continuation of disfunctional comments as unfit for purpose as is @178. I suppose the idea of making scientists run around like Keystone cops chasing down false leads could be amusing in some circumstances. But even a running gag gets old. Day after day, month after month, year after year, and it’s just an expression of contempt pure and simple — however politely couched. As suggested, perhaps the just using the simple, two word response, “That’s dishonest,” would go a long way toward short circuiting the obsessive pranking. Clarification could be supplied to newbies upon request. BTW, anybody got Prince Albert in a can? Despite the Tone Patrol’s cautions about proper comportment in the face of relentless unreliability I’m still not inclined to agree w/inversions of what Twila Moon said. The two expressions are not equal. The former was fabricated– synthesized from dissected parts reconstructed to say something wholly original to this blog comment thread– while the latter statement was directly expressed by Twila Moon. After this sort of thing happens often enough it’s not reasonable to expect folks to remain entirely polite. Please read post #187, where MA quotes Twila Moon about the 30% referring to fast-flowing glaciers. You seem to have ignored that feature in the report. That in the 30% only referred to glaciers in the SE and NW, while all others short very little change in speed. Still, a smaller curve than you stated. Ian Howitt could just as accurately said, “There’s the caveat that this 10-year time series is too short to really understand long-term behavior, so there still may be future events that could cause large decreases in glacier speed. Or perhaps some of the big glaciers in the south of Greenland that have exhibited large changes may begin to slow down, which would greatly decrease the rate of sea level rise.” This is pure speculation on his part. There is no reason to expect that only the worst case events could occur. Now simply imagining what was said, with quotation marks. Like a verbal functional image of the interior mechanics of the subject brain. Sasgen et al., Earth and Planetary Science, 2012 is a nice paper, but i wonder if the precipitation term from RACMO2/GR in say Fig 2 could be separated into snowfall and rain ? the latter is far more destructive of ice. You’re making a supposition which is counter to previous experience. DanH is unable to give a reasonable question/statement/contribution without immediately falling into the deep end of a sewage pond. Read DanH’s posts, wipe off the goop, and you’ll see that the constant theme is that the data record is too short to determine long-term behaviour. By the way, this sentiment is expressed at least twice in the OP. Dan H quite naturally, and completely beyond his control, expands/calculates/defines this uncertainty so it envelops his comfort zone, where the melt rate will trickle on harmlessly or perhaps even reverse. I limited it to surface temperature trends and we’re talking 90 year horizons, so I think I am correct, though perhaps not as precise as you’d like. I don’t like abusing bandwidth and people’s time, so I often don’t expand “obvious” references. The 17 years was referring to Santer, and 30 years referred to the traditional climate/weather divide. Year to year is weather. 30 years is climate. If that ain’t a rule of thumb, there are no rules of thumb. My opinion I suppose. If you like, substitute whatever numbers and conditions you approve of and change the wording from rules of thumb to _____. It won’t change the core issue – skeptics are correctly bashed for using a decade’s worth of data to determine temperature trends, yet here folks are not just drawing trends, but shaping and extrapolating over the course of the next century — even though one of the primary drivers for the melt rate is weather! Remember the Piomas thread? Arctic sea ice is expected to at least double over the next few decades (though I’d probably bet otherwise). That should counteract a fair amount of acceleration. OTOH, the current temperature plateau has driven us to the bottom half of the probability distribution for temperature, so it is likely that we’ll get a surge in temperature in the near future. “Even though 10 years of essentially flat temperatures are woefully inadequate to determine much of anything about long-term trends in surface temperature, 10 years of data are plenty to reasonably estimate the long-term trend for ice sheet melting, along with the trend’s basic shape because _________”. it follows the long term trend in atmospheric CO2. Don’t just look at the shape of the lines that can be drawn through the various dots on various charts. Look at the physical change in the atmosphere causing the change in the ice. Above you write “Remember the Piomas thread? Arctic sea ice is expected to at least double over the next few decades” (no pointer given). Nope, I don’t remember anyone saying that’s expected. I looked. I saw that you wrote there that you predicted “a HUGE increase in sea ice volume for September … or … I’m confused” (PIOMAS thread at 28 Apr 2012). Was that what you’re referring to? Whether or not you can establish the existence of a nonzero trend from data, doesn’t depend only on the length of time or number of data values. What you want to do is separate the signal from the noise. If the signal is bigger, it’s easier to do — so you can do it with less data. If, for instance, global temperature were increasing at a rate of 100 degrees per year (but the noise level remained the same), you wouldn’t need 17 years’ data, you’d know in a single year. If the noise is bigger then it’s harder to do so you’ll need more data. If, for instance, the noise level for the year-to-year fluctuations in annual average temperature were +/- 5 deg.C (rather than the actual value of about 0.1 deg.C) the higher noise level would make it hard to detect the trend and you’d need a lot more than 17 years’ data. The crucial factor, therefore, is the signal-to-noise ratio. If that’s high enough, you can find a trend with very little data. If it’s low enough, you’ll need a helluva lot to find the trend. because it follows by preconceived notions about what I feel should be happening.